A few months ago, I looked at politics in music, and while overseas artists and communities concerned themselves with apartheid and world hunger, conservation of the environment was a big issue in Australia. Part of that was down to the discovery of a hole in the ozone layer over the southern hemisphere in 1985 - something which directly impacted our way of life. Plus, in between the Franklin Dam stand-off earlier in the decade and the Clean Up Australia movement, which launched in 1989, activism was becoming a national pastime. That said, concern for the environment didn't necessarily make people rush out and buy records on the topic. This week in 1989, two songs dealing with conservation cropped up as breakers on the ARIA chart. One, we'll look at next week when it briefly enters the top 50, while the other didn't even get that far. A third single will also venture into the lower reaches of the top 50 in the coming weeks. A song that people were rushing out and buying this week in 1989 - once again - was "Eternal Flame" by The Bangles, which returned to number 1 for a third and final week. Here's the environmentally themed song which didn't make it as far as the top 50, performed by former Young Talent Time cast member and reformed drug addict Debbie Byrne. Her career back on track, Debbie was starring as Fantine in the local production of Les Misérables, and it was with the cast of the stage show that she recorded "Nature's Lament". Despite the good intentions of the song, it's a pretty dull track - which may explain its chart peak. Before their record company won the services of Stock Aitken Waterman in a charity auction, Brother Beyond were just another pop band whose highest UK chart position was number 56 with the original version of "Can You Keep A Secret?". Their first SAW single, "The Harder I Try", improved that by some 54 spots, reaching number 2 in mid-'88. Naturally, Australia was a bit late to the Brother Beyond party - in fact, we never really joined in, with this second SAW track (a number 6 hit the previous November in Britain) missing our top 50 despite a promo trip by the group and a 2-for-1 offer on "The Harder I Try" and "He Ain't No Competition". I actually bought one of the two 7" singles in one store (which didn't have the offer running) before noticing the deal elsewhere, going back to the original store to return my purchase and returning to the second shop to get both. Yet another of Virgin Records' Singles Of The Week from a couple of weeks ago shows up in the breakers section - and Paula came agonisingly close to scoring a second top 50 hit from her album of the same name. While the singer/choreographer was on a hot streak in the States - "Forever Your Girl" became the second of her six US chart-toppers - she'd have to wait until 1990 and the album's seventh single (including one re-release) for more Australian top 50 action. Fun fact: that's a young Elijah Wood you can see in the music video below. Blasting back onto the scene with the first single from second album These Here Are Crazy Times, my second-favourite Australian band of the '80s enjoyed their biggest hit since debut single "Great Wall" cracked the top 5. I always felt like BCO weren't as successful as they deserved to be - and I've never quite understood why. Songs like "Onion Skin", "Great Wall", "Hands Up In The Air" and "Her Charity" had all been incredibly catchy and radio-friendly without being cheesy. But, the band never made it into the big league - despite, as we'll see when the rest of the singles from These Here... make their debuts, having the material to do so. This song made it two top 10 hits in a row for former (at the time) Cold Chisel guitarist and sometime vocalist Ian Moss, with "Telephone Booth" a worthy follow-up to the Aussie classic "Tucker's Daughter". The album both those tracks were taken from, Matchbook, also hit number 1, suggesting Ian had a bright solo career ahead of him - although, as we'll discover in a couple of months' time, appearances can often be deceiving. At the start of the decade, he'd been a regular in the top 10 in Australia, the US and the UK - but by 1989, the former Beatle's days of chart glory were behind him. This lead single from his first studio album in three years, Flowers In The Dirt, was co-written with Elvis Costello but only became a middling hit around the world. It wasn't the last we'd see of Paul on the ARIA top 50 - in fact, he appeared on another track around the same time as "My Brave Face" which made its debut the very next week. 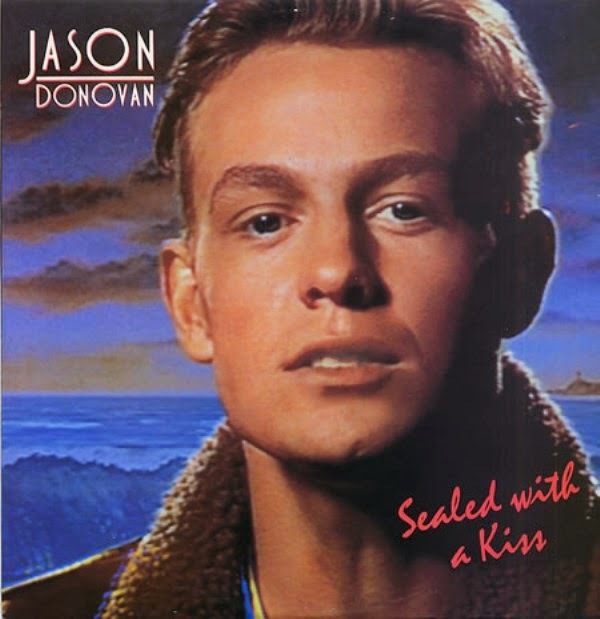 This may have been the single that tipped Australia over the edge when it came to Jason Donovan's music career - since he never managed a chart peak anywhere near this high with any of his subsequent singles. Plus, his version of "Sealed With A Kiss", which had already been a hit for four different artists (Brian Hyland, Gary Lewis & The Playboys, The Toys and Bobby Vinton) was insipid to say the least. But, that was the MO of producers Stock Aitken Waterman when it came to cover versions - choose a deathly slow jukebox hit of the '50s or '60s (see also: "Tears On My Pillow", "End Of The World", "Hey There Lonely Girl") in the hopes that grannies would buy it out of nostalgia along with the young kids who bought it because they were fans of the act in question. Next week: the albums chart changes forever. We'll also remember another conservation-themed single as well as a UK chart-topping charity record. Before then, I'll conclude my look back at my favourite songs from 2005, which includes an appearance by my favourite Australian band of the '80s. Somehow I didn't hear 'Sealed With a Kiss' until it was a new entry on the Rage top 50. Having read about it before then, I knew it was a ballad... but I was surprised at how 'old fashioned' it sounded. It really was a strange single choice in retrospect. Listening to 'Nature's Lament' now... how on earth did that even enter the top 100, let alone become a breaker? Had to switch it off after 2 minutes. It's a pity Brother Beyond didn't have more local success. 'The Harder I Try' even questionably made it onto the 'Hits of '89 Volume 2' compilation, despite not even becoming a breaker, which would have given them more exposure. I've always thought 'Forever Your Girl' was the weakest of the singles from Paula's debut. I would've gone with 'I Need You' from the album's non-single tracks. The single remix of FYG helps it a little, but not much. I remember waiting weeks for it to crack the top 50 so I could record the full video from Rage, to no avail. Something that would later become a pattern for me, with my liking for flops. 'My Brave Face' was one of those quickly-forgotten tracks. I don't think I've heard the whole song since 1989. One thing I remember from this week's album chart in 1989 (since I've recently viewed a scan I did of it a while back), is that Paula Abdul's 'Forever Your Girl' album is also listed as a breaker... despite debuting at #50 the week before. I don't recall seeing any other breaker listed that was going down the chart after entering the top 50 (albeit briefly) the week before; though it happened (after at least 2 weeks) with Rick Astley's 'Take Me To Your Heart' and The Adventures' 'Broken Land'. Maybe ARIA were desperate that week, as there weren't sufficient other breakers that were yet to crack the top 50 in the lower half of the top 100? I like Knocked Out least - which is odd since I like so much other LA Reid & Babyface stuff from that era. But I agree I Need You is a great album track. 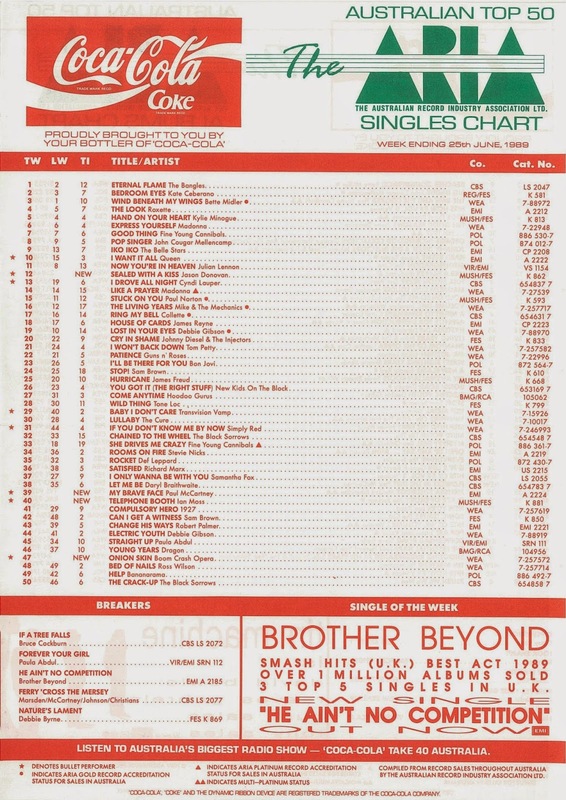 PS I love how the ad for Brother Beyond claims that they have "3" top 5 UK hits, when in reality it was only one. I liked JD 'Sealed With A Kiss'. Unfortunately, I don't have a recording of it anywhere in my music collection. I should download it off iTunes? I remember The Factory on ABC had a competition going prior to the release of his debut album and you had to come up with a title for the album. Can't remember what the prize was, but I came up with the title 'One Good Reason', but never sent it in and then I find out that he named his album 'Ten Good Reasons'. So close, I should have entered. LoL. Boom Crash Opera are a great band and deserved greater success. I think the stand out single off 'These Here Are Crazy Times' is 'Dancing In The Storm'. To me, this was the album of Summer '89/'90. Paul's chart success was waning, but he still had one more great single to come in early '93 with 'Hope Of Deliverance' - like the video too. Ha ha at the competition. I'm guessing it probably wasn't 'for real' though, since Jase's album debuted on the UK chart in mid May 1989. I don't remember if it was Smash Hits or Number One, but a review of the album in one of these mags poised the relevant question - why is the album called 'Ten Good Reasons' when there are 11 tracks on it? In the music section of my local K-Mart one day, I witnessed a teen/tween girl pleading with her mother to let her buy Jason's album. Her mother said something along the lines of, "But will you still be listening to it in 6 months from now?" 'The Best Thing' was probably my favourite BCO track ("my brains are on a plate" was a memorable lyric) - of course the one that flopped the hardest from the album. My mother used to ask me the same question about records I bought. She was especially down on singles - called them a waste of money. Yeah, the Ten Good Reasons vs 11 tracks conundrum was funny. Which track wasn't, in fact, a good reason? My vote is Change Your Mind or Time Heals. I will reveal (ooh, exciting!) my favourite BCO track when it arrives on the chart (although it does feature in my already-posted year-end countdown for the appropriate year). I was surprised they tacked 'Especially For You' on to it, and assumed that was the non-good reason. My mother thankfully never questioned my musical choices, no doubt partly because I nearly always did my music shopping solo. But I would instead make up for it by umming and aahing a lot of the time over whether I should or shouldn't buy something. I thought singles were a good deal at the time, rather than spending nearly $20 on an album where you only knew 1-2 of the songs, and the rest was filler. When $9.99 (at first) CD singles came in, that was another matter. Nathan, I'm pretty sure the JD competition was held around Feb '89. My fave Paula Abdul track from that period is her Megamix Medley that was released around September 1990. A few years back, I got her Greatest Hits CD cause it had the Megamix on it. But to my disappointment it was not the one that I wanted and sounds crap! Was the Megamix that charted in Aus around that time only released in Australia? I think her best single is 'The Promise Of A New Day' which coincidentally is another environmentally themed single. The single that was released here was the 1990 Medley Mix, taken from Shut Up And Dance - her remix album (a remix of Straight Up was also released as a single here). The one on the 2000 Greatest Hits album is a different medley. Michael, as far as I know, '1990 Medley Mix' was only released as a single in Australia (and possibly also in New Zealand)... although from memory I've also seen a promo US CD single for it on discogs.com. I bought the cassingle, hoping it would be the same edit they used for the video, but it was the full-length version available on the 'Shut Up and Dance' album. Thanks for the info. Lucky i still have the 1990 Medley Mix on audio cassette recorded off rage Top 50 back then. It sounds like a rarity ie the video edit.